401k Early Withdrawal: What to Know Before You Cash Out - MintLife Blog If you’re considering a 401k early withdrawal before retirement, it’s important to be aware of the taxes and fees that you’ll incur and how to avoid them. A normal, penalty-free 401k withdrawal occurs after retirement or after you’ve reached the age of 59½. The funds are subject to income tax just like your paycheck previously was. 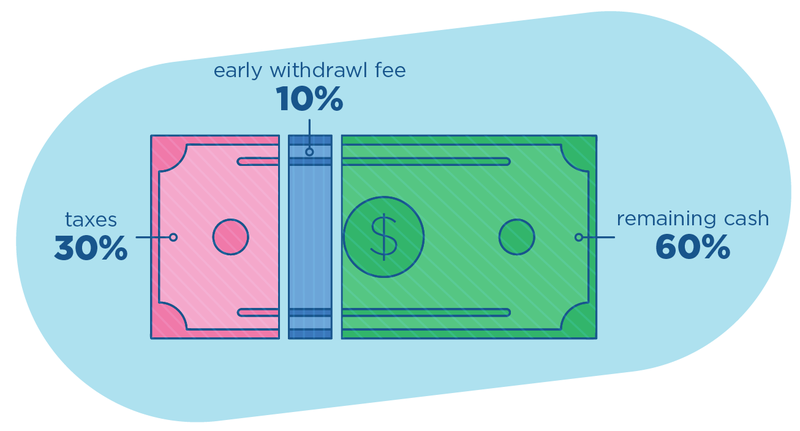 However, if you choose to withdraw funds before the age of 59½, there will be penalties. Every early 401k withdrawal is subject to income tax as well as a 10% early withdrawal penalty tax. 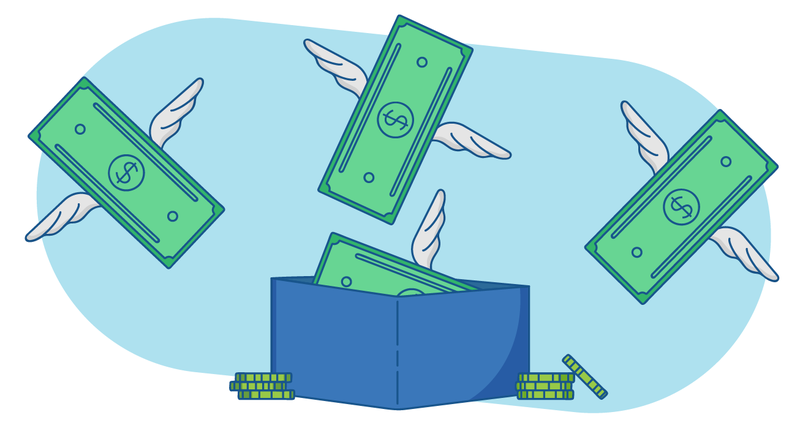 You can cash out up to 100% of your 401k early, but depending on your tax bracket, this could cause you to lose almost half of your savings. Additionally, you’ll lose out on potential future savings growth. When it’s time to file taxes, you’ll owe more because your taxable income has increased. If your withdrawal was substantial, it may even push you into a new tax bracket, causing you to owe even more to the IRS. This leaves you with a meager $29,000 left—a little over half of what you started with. This early 401k withdrawal calculator will give you a better grasp on your specific numbers. If you’re in a pinch and need to use your 401k savings, an alternative to an early withdrawal is to take out a loan from your 401k. If your plan allows it, it could have significantly less of an impact on your retirement savings, given you pay it back. If you fail to repay the loan plus interest, it will be treated like an early withdrawal, and you’ll be subject to the penalties. Another option to keep your savings intact is to roll them over into a traditional or Roth IRA account. If you’ve left a job and don’t know what to do with your 401k, this is a good option. A direct rollover is ideal, because your plan writes the check directly to your IRA. If you choose an indirect rollover, your plan writes the check to you, but the process is more complicated. Consult your financial advisor if you’re ever unsure. 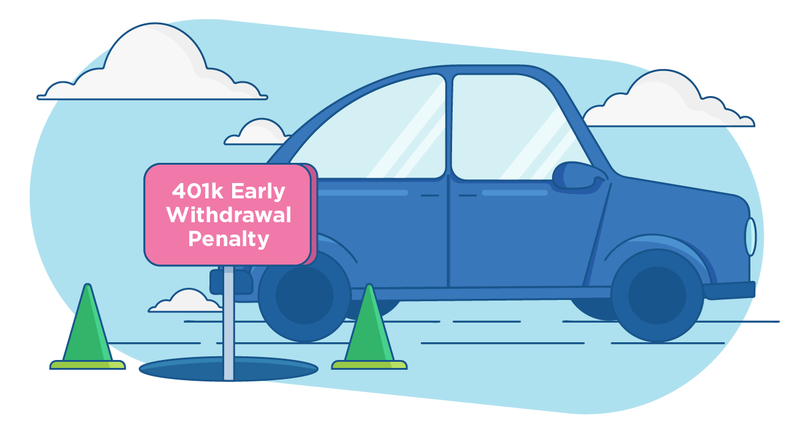 Because of the many roadblocks to 401k early withdrawals, you may find you want to keep away from your 401k until you’re retired — just be sure to consult your financial advisor if you’re ever unsure. Remember that diligently contributing to your 401k now will set yourself up for a happier, less stressful retirement. Because when that time comes, you’ll have earned the right to spend less time worrying about money and more time sipping mai tais on the beach. This is very helpful. It makes people think before taking out cash for “emergency” situations.